Things are just things - small tokens that mark our lifetime and become reference points for memories and experiences. But sometimes - a thing can become more significant to us. Sometimes, an object can become our only link to a memory or a moment from our past, moving far beyond the utility of the item itself and instead evoking a deep emotional connection. It could be a message from a lost loved one, special coins given to you by your child, or even a patch-enblazened leather jacket that traces your storied pass. Once in a while there are a few things in life are Worth Holding Onto. 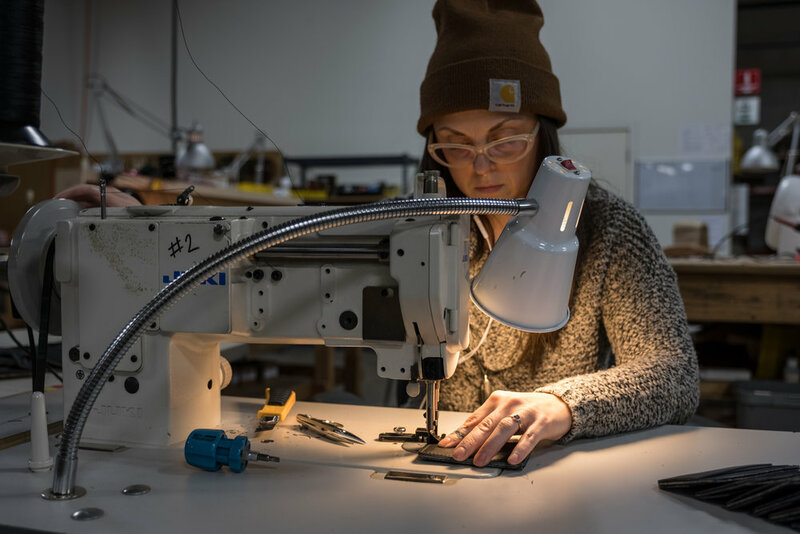 Just as the creative profession is constantly changing, shifting and overflowing with fresh ideas and innovation, so is the city of Portland, Oregon. 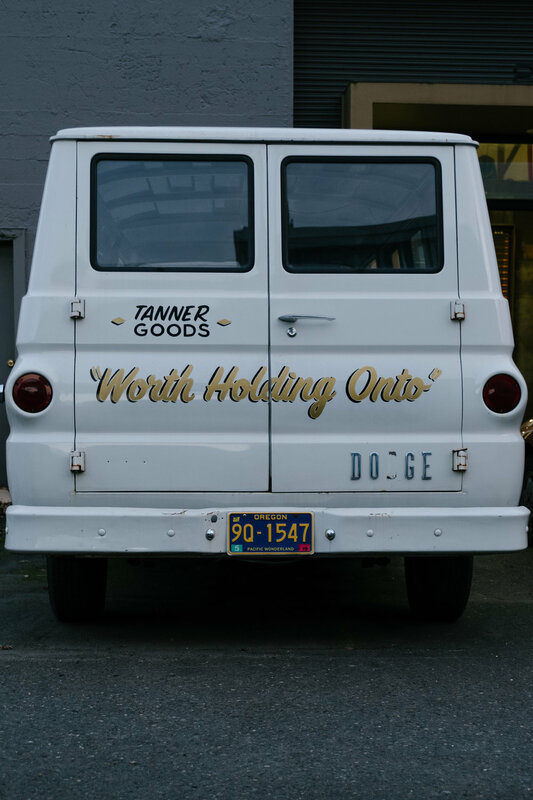 So when it came to planning our upcoming Table for Ten event, we couldn’t think of a better venue than the Tanner Goods and Mazama Wares workshop, located in the heart of Portland’s Industrial District. 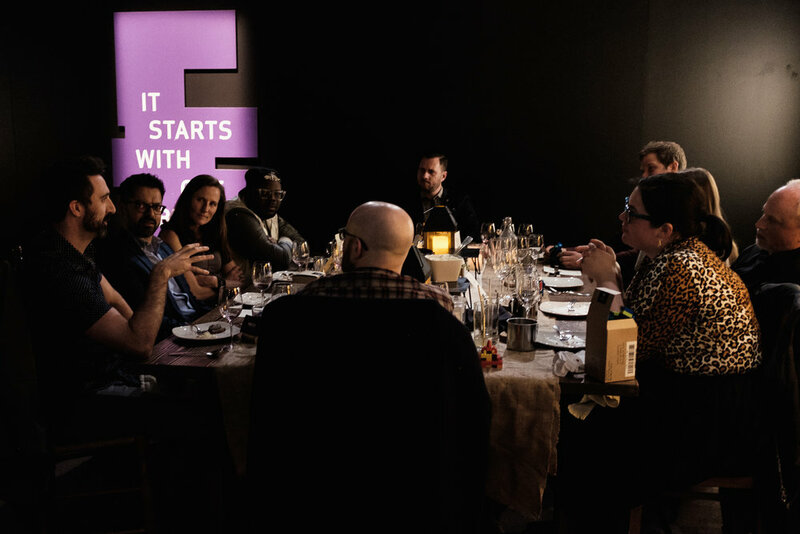 Surrounded by a maze of overlapping bridges, railroads, waterways and metro tracks, each tasked with mobilizing the city’s culture, it was an ideal setting for an evening of connection, conversation and fine dining with ten curious creatives. 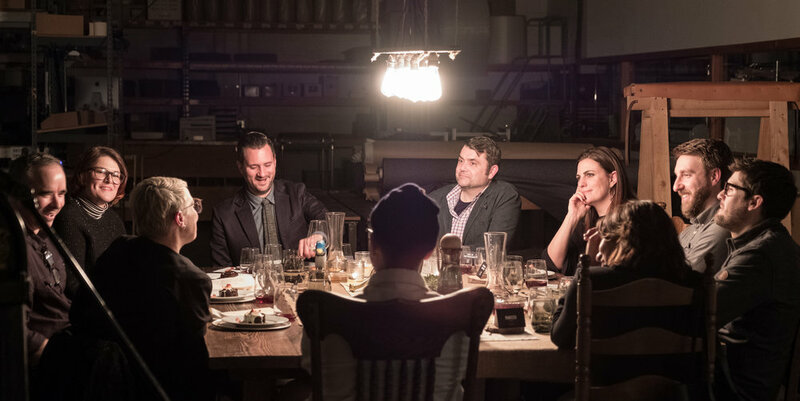 After an intimate tour of the innovative, craft-inspired space by owners Sam Huff and Meghan Wright, our guests took their seats and kicked off the evening. Park Kitchen served up 5 sumptuous courses each paired perfectly with select bottles of wine from David Hill Winery. From pan-roasted sturgeon showered in a light miso drizzle to a mountain rose apple cake lathered in a chevre creme anglaise and toffee, our taste buds were bursting with delight. Once our forks rested our guests began to share the cherished items they brought to the dinner in line with the evening’s theme “Worth Holding Onto”. 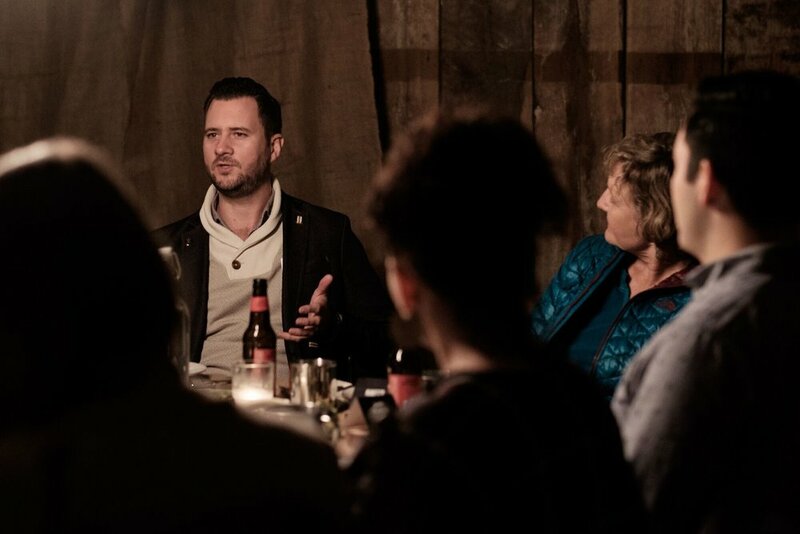 Some stories were amusing, some were serious, but most importantly, each item resembled something raw and personal, further solidifying a connection between each guest seated at the table. 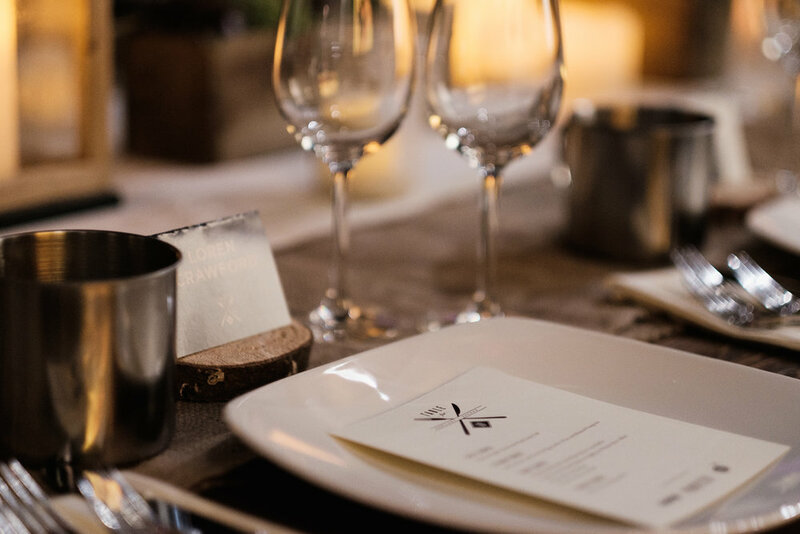 As we closed our night, Tanner Goods and Mazama Wares graciously gifted our guests with a pair of wine glasses and leather coasters to commemorate the evening together. 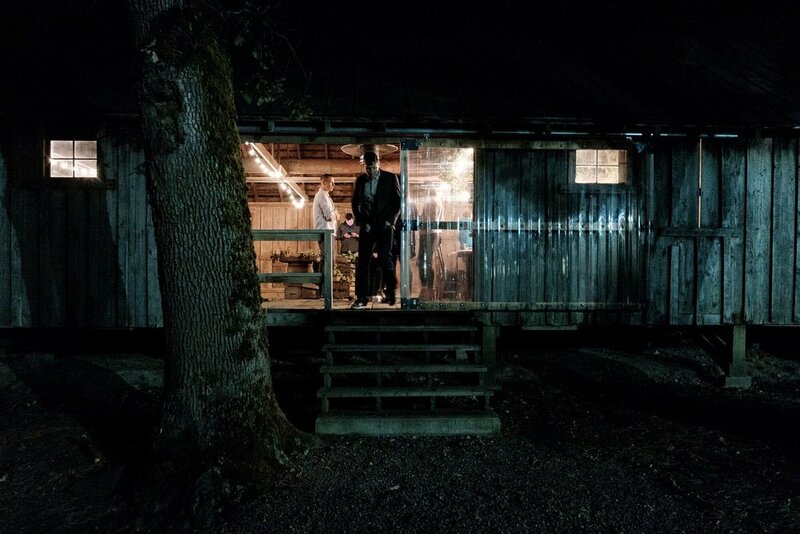 A special thanks to our hosts, Tanner Goods and Mazama Wares, to David Hill Winery and Park Kitchen for partnering with us for another memorable Table for Ten. In a season where we slow down to celebrate a bounty of harvests with hayrides and pumpkins, it often takes leaving Portland’s boundaries to immerse yourself in the agricultural industry that creates the vibrant food scene in Portland. 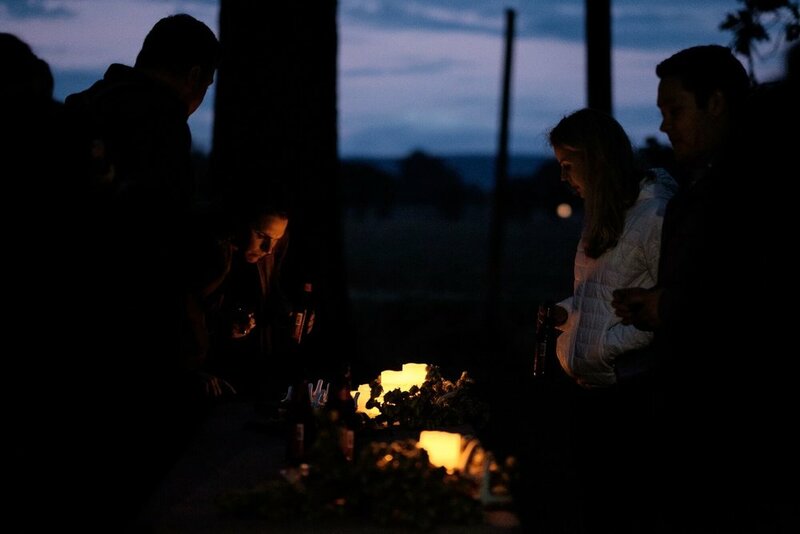 Nestled among the scenic farmlands of the Willamette Valley, Goschie Farms provided a rich backdrop for our Fall Table for Ten event. This hop farm, which has provided hops for some of Portland’s oldest breweries, has a heritage of harvesting hops for the last 130 years. The old rustic barn, decorated with drying hops, helped inspire our theme of “breaking boundaries”. With history and pioneering innovation in mind, we partnered with Park Kitchen and Widmer Brothers Brewing, to express the true power of long-established relationships resulting in carefully-crafted provisions. 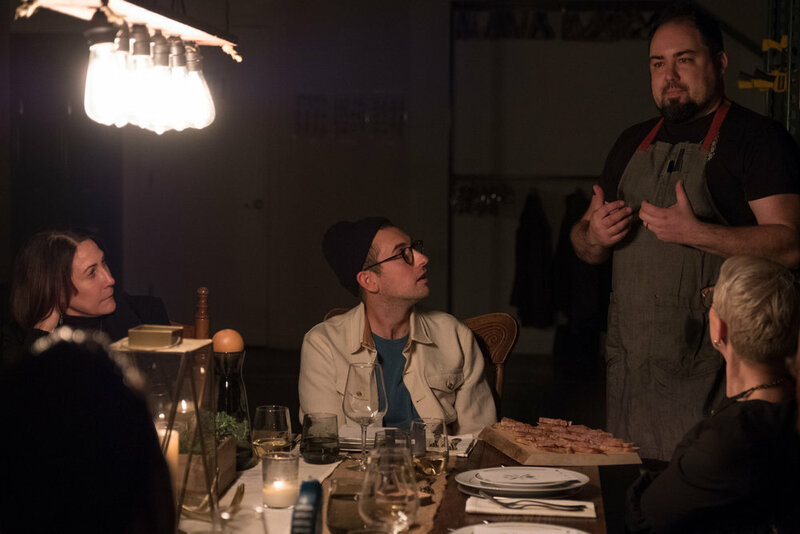 The two partners worked in tandem to create pairings for each course for a hop-infused dining experience served alongside Widmer crowlers filled with hand-selected beers. 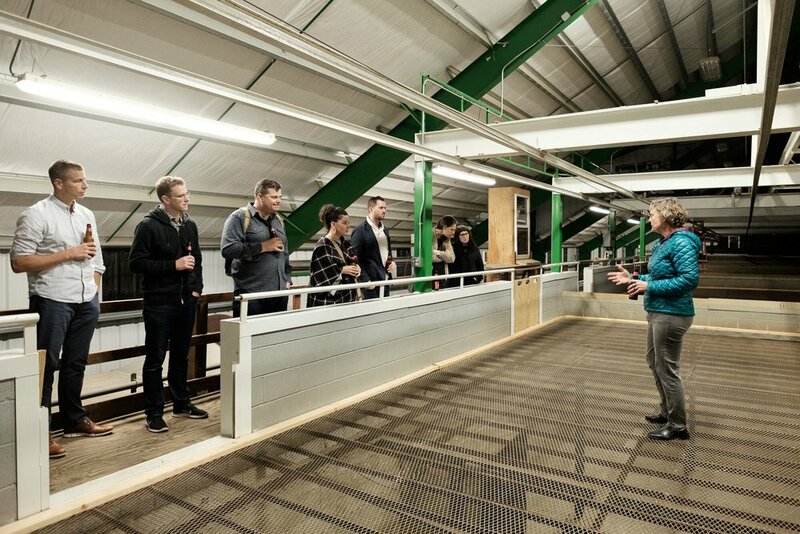 Upon arrival, our guests toured the farm with appetizers and cold beers in hand by guidance of Gayle Goschie, a third-generation family member and manager of Goschie Farms. 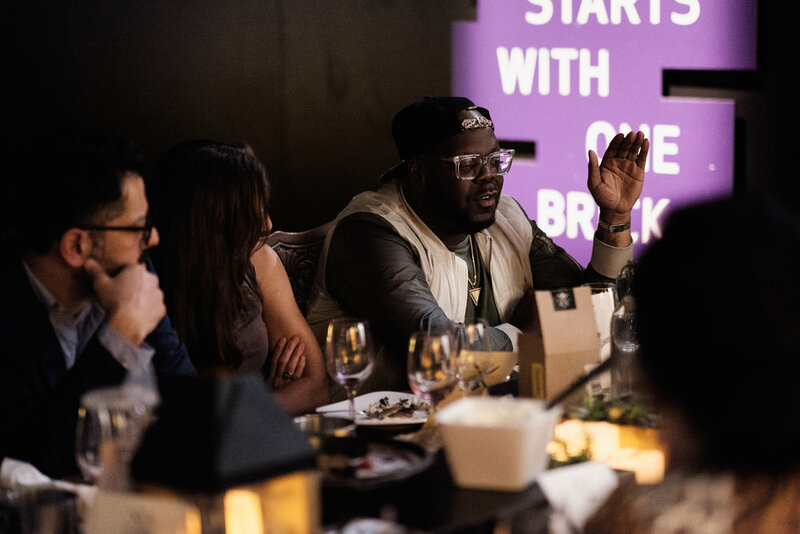 Our evening was full of personal revelations as each guest was asked to bring one item to the table that exemplifies how they have broken boundaries. Concluding our night, Widmer Brothers Brewing gifted each of our guests with a 22 oz. bourbon barrel aged brew, bottled in 2012. Additionally, two guests were nominated to create and brew a new style of beer with Widmer, set to be released later this Fall. 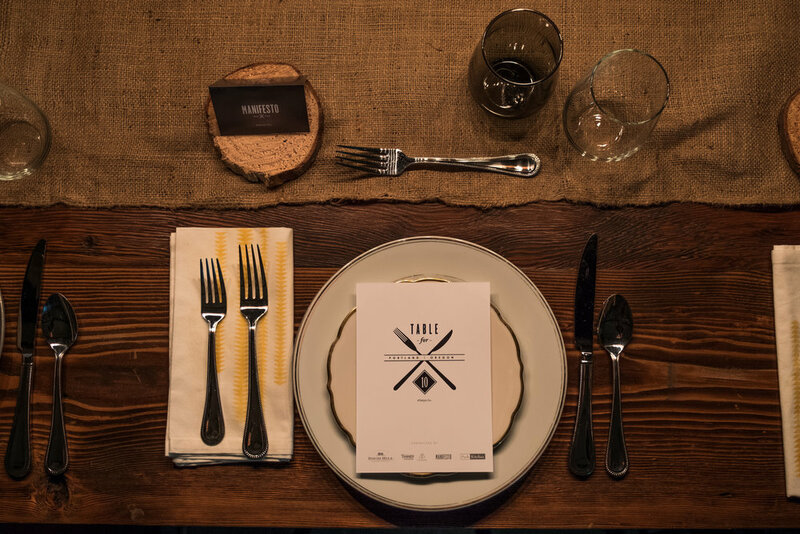 Thank you to our host, Goschie Farms, and our partners at Park Kitchen and Widmer Brothers Brewing for making this night an extraordinary culinary and storytelling adventure. Sometimes the best stories come in the most unusual forms. And sometimes they come in 100 different pieces. A week before our last event, we sent each of our guests a box of 100 unmarked LEGO pieces. The singular objective - build a 3D creation that tells your story to 10 of your peers. Descending on OMSI for Table for Ten, our guests sipped hand-crafted cocktails during a private tour of OMSI's The Art of The Brick Exhibit on May 16th. From life-size statues to Lego replica's of famous paintings, the intricacy of the designs inspired conversation. OMSI's Theory created a deconstructed 4-course tableside dinner while our guests dined amidst some of the most iconic LEGO art ever created. An Oregon native, Nathan Sawaya has created a wonderland of sculptures ranging from a T-Rex skeleton to a foreboding Easter Island statue, his work exudes creativity. In our case, the best stories of the night emerged from taking these 100 disparate LEGO pieces and turning them into a powerful storytelling vehicle anchored in connecting Portland's creative community.